"It's hard to get there and it's even harder to win." That's what Lake Oswego head football coach Steve Coury had to say after his team beat Sheldon 34-27 in the Class 6A state football championship on Saturday. Coury knows that as well as anyone. 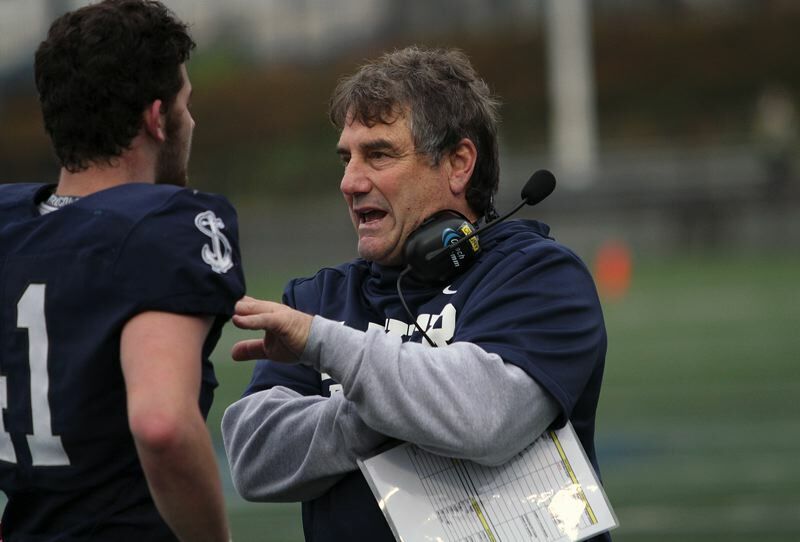 During his 27 seasons as a high school head football coach — all of those at Lake Oswego — Coury has taken six of his teams to state championship games, but until Saturday, the Lakers had won just once (in 2011). So when the 2018 Lakers finally finished off Sheldon, crafting a seven-play, 75-yard scoring drive to win the game with just 2 minutes, 33 seconds left in the fourth quarter, it meant a lot. "What a great high school football game. What a great ending to a season, really," Coury said. "It was a great game." That said, Coury realizes better than most people how much of a difference it makes when your team ends up on top. While his team win 2011 — beating Sheldon 47-14 — the Lakers also lost four other championship games. First came a 31-24 loss to Sheldon at PGE Park in 2002. After that was a 30-27 defeat to Sprague at Autzen Stadium in 2004. Next came a 35-21 setback to Southridge at Reser Stadium in 2008. And finally, after beating Sheldon in 2011, a 13-6 loss to the Irish at Jeld-Wen Field in 2012. "We've been fortunate enough to get there a lot, (but) I've been on the other end of those ones, too," he said. "I told the kids starting out the week on Sunday, 'Let me assure you this — the team you're playing is really good.' I said 'You don't get to the finals and not play a very good team.'" Because his players know the Lakers' history, too, they loved the chance to give LO's longtime coach another championship victory. "I got to say one thing, we've got the greatest coach of all time, Coach Coury, and without him, I don't think we'd be here," said Lake Oswego senior defensive lineman Mike Mercep, the Three Rivers League co-Defensive Lineman of the Year. "Great coaching — that's why we came up out on top." "Our coaches deserve it more than anybody," said junior running back Casey Filkins, the TRL Offensive Player of the Year. "The last time they've been here was 2012 and they lost it. We just wanted to get it back for them and just get them what they deserve and we earned it. Nobody's going to take this away from us." For his part, Coury was as happy as any of his players to win, but felt compelled to share credit with his coaching staff — including sons Jordan and Stevie Coury — many who've coached with him for years. That group includes Brian Bartsch, Frank Everhart, Karl Halberg, Chris Hubley, Brian Newcomer, Jordan Coury, Greg Lord, Steve Smith, Bill Hewes, Justin Wojciechowski, Brandon Akerman, Taylor Brown, Stevie Coury, Matt Stutes, J.J. Brumfield, Nick Halberg, Tim Haney and Steven Long. "The staff I have, those guys just don't give up. I'm always the guy out front but those guys do all the work," Steve Coury said. "Their families give up a lot of time. It's a labor, passion, but it's not a rewarding thing as far as salary goes. It's all about everything else. They're always in the background and I almost feel bad, I really do, because they do so much of the work." Those assistant coaches aren't just appreciated by Steve Coury, either. The Laker player definitely took notice of the leadership and sacrifices that come from that group. "Our guys, our coaches, have coached us to perfection," said senior quarterback Jackson Laurent. "Every single drive, we take pride in running the ball hard, blocking well, throwing well, making catches downfield and being safe with the ball. If you do that well … they can't stop you." For now, with 27 seasons under his belt and two state championships, Coury has no plans for retirement. "I don't plan on going anywhere, but you never know," said Coury, who carries a career record of 235-82, tied for 15th-best in Oregon history. "I've got a job that, anything can happen. I always say I'm planning on (coming back) but time will tell." As with most things in sports, though, winning makes everything better. "It's a real satisfying feeling, obviously," Steve Coury said. "You start out and the goal is always to win the thing because that's the ultimate goal and everybody's shooting for that. The realization of that is it's hard to get there and it's even harder to win it."